It’s strange how, as a species, we hanker after awards and achievement badges. Online, this has become known as “gamification” and is used to great effect on fitness apps such as Fitbit. But badges are also used on social media to verify a person’s identity, and suddenly everybody wants one. It’s become a sort of “badge of honour”. 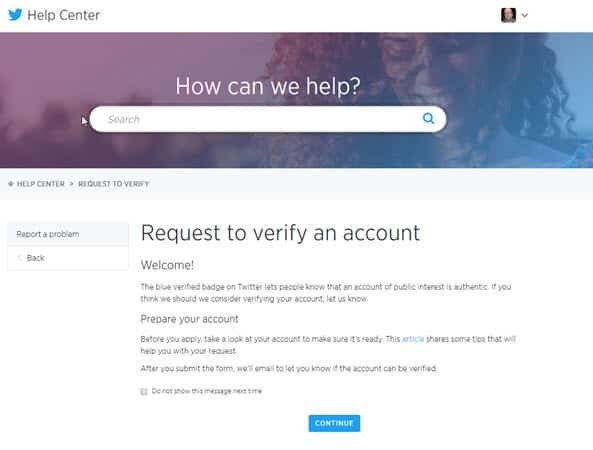 So how do you get your Twitter account verified? It’s worth pointing out from the get-go that you will only get verified if you are “high-profile”. This is something you have to prove to Twitter and which they make a judgement call on. You have to show that either you have already been impersonated, or there is a real risk of it happening. But if Twitter rejects your application, you can keep trying once every 30 days. We approve account types maintained by users in music, acting, fashion, government, politics, religion, journalism, media, sports, business, and other key interest areas. 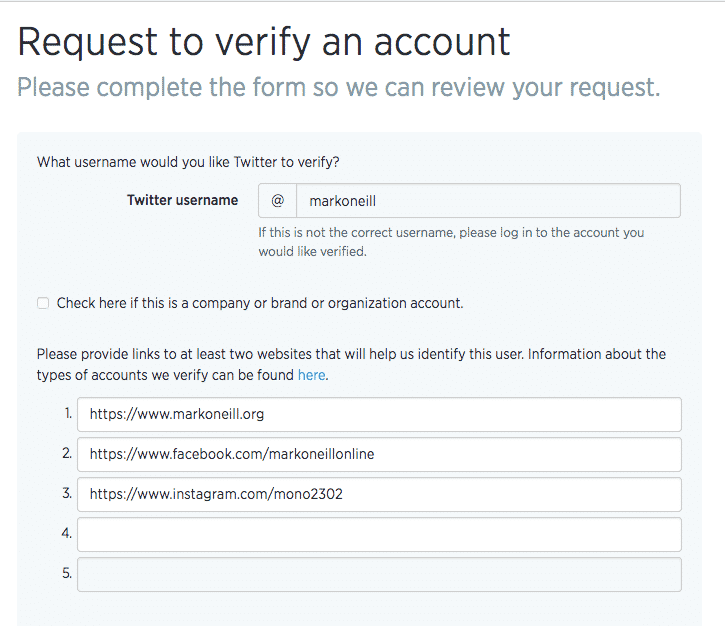 So what exactly is verification? Well, if you use Twitter a lot, you will have seen the blue tick logo next to some users names. For example, if you were to start typing in a person’s name, the blue tick appears in the drop-down menu. 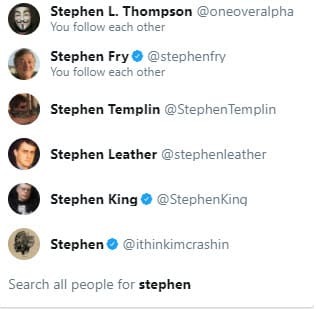 This is what you would see if you started searching for “Stephen”. The benefit of seeing the blue ticks in the menu tells you right away which one is the real person and which one is the imposter. The real person has gone to the trouble of proving their identity to Twitter, so you can rest assured that it is the right person. If you go to that person’s page, the blue tick is now clearly displayed next to their name. So if you feel you have a high-profile status and need that verification symbol too, let’s put in a quick application. I am starting to publish fiction novels, therefore my online presence is growing. Therefore I decided to apply for the verification. A confirmed email address (if the account is a company, the email address must be the company’s domain email). A bio on your Twitter page. A profile photo on your Twitter page. A header photo on your Twitter page. A birthday (not required for company Twitter accounts). A website listed on your Twitter bio. Your tweets MUST be set as public in your account privacy settings. Once you have all that, it’s time to apply. Start by going to this link. Here you will find the form. Click “Continue“. 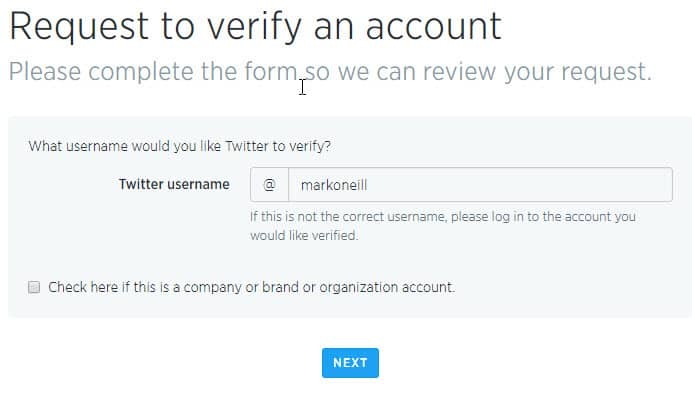 Obviously you need to be signed into the account you want verified. 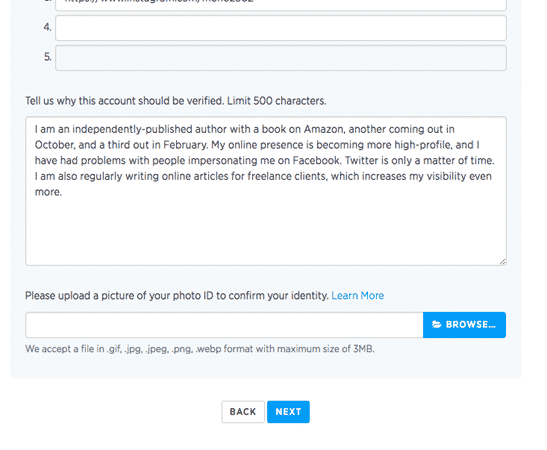 Specify the username of the account you want verified. Also state if it is a company, brand, or organization. If it is a personal account, leave the box unticked. Click “Next“. On the next page, you will be asked for some online links (up to five) to show your work. This is a chance to show Twitter the kind of work you do, which would justify verification. Social media profiles are good, as are personal and company websites. If you are a musician, a YouTube channel of your music concerts might be appropriate. 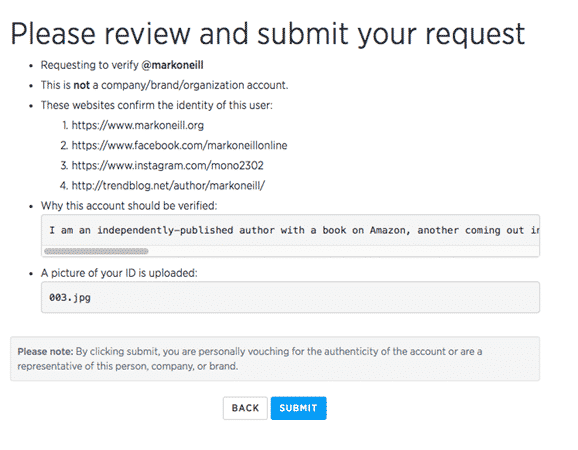 Further down, you will then be asked to explain in more detail why you think you need your account verified. Thankfully they give you more than 140 characters to do this. However, 500 is not really much better, so you need to work on saying as much as you can in 500 words. The last part is you MUST send them undeniable proof of your identity. This means scanning some form of photo ID and uploading it with your application. The two preferred ones are either a passport or a driving licence. If you are in the EU, a national identity card would also be sufficient. Since I don’t drive, and the UK doesn’t have identity cards, I was left with the passport option. I can understand if you are hyperventilating at this point at the thought of uploading your photo ID. In this day and age of identity theft, such concerns are not unjustified. But I would say this. First, it’s Twitter, not your local loan shark. So I think you can trust them. Secondly, you’re uploading it over a secure HTTPS connection. Third, you’re not going to get verified without jumping through this hoop. It’s not like you have a choice. You cannot conceal the serial number on the document. The whole thing must be easily read. So use a proper scanner and don’t blur anything out. Once you have uploaded the photo ID, click “next” and you will have the opportunity to check your application before it is sent. If any of the information turns out to be wrong, just hit the “back” button and amend it. When you are satisfied with what you have typed, click “Submit“. That’s it. So how long does it take for a decision? That varies. The first time I applied, they rejected me within a couple of days. My second attempt was rejected within a few weeks. Basically, Twitter will take their own time and will not be rushed. So just apply for it and then forget about it. 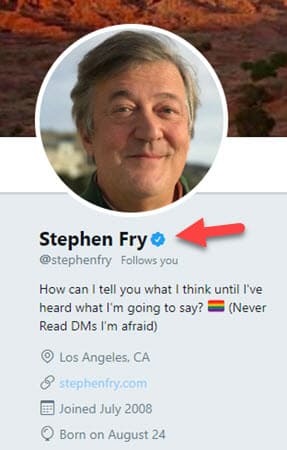 Maybe then, one day you will glance at your Twitter profile and see that coveted blue tick sitting there.